Can you recall the last time you received a handwritten note in the mail? By mail, I mean snail mail and not a virus-dodging attachment flying through electrons hoping to make it to your inbox. I remember my last note; it felt like Christmas or my birthday. Why is that? 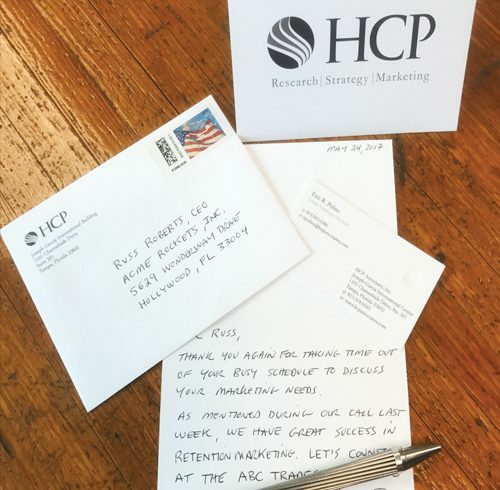 Well, it’s because the thank you note is becoming a lost art and stands out like a neon billboard on a desk of junk mail. The fact is that very few people take the time to pick up pen and paper to express their feelings. And, being a member of Gen X, I appreciate and understand that newer generations prefer a text or email to convey their thanks. However, while it may be quick and efficient, I think technology lacks a personal connection. I’m not recommending going off the grid, but if you want to build and maintain relationships, and continue to profit in the business, you need to consider the value of the writing notes by hand, on occasion. Part of marketing yourself and/or your business is to stand out from your competitors. 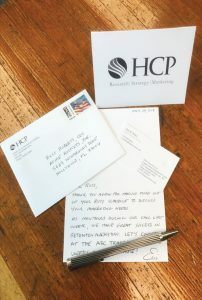 We all want to be noticed and remembered; investing the time to write a note and peel a stamp could just be that little something extra for your potential or existing client to feel special. Let’s bring back the long lost art of writing a thank you note; maybe even write one in cursive!